"Dekho dekho, wo aa gaya!" 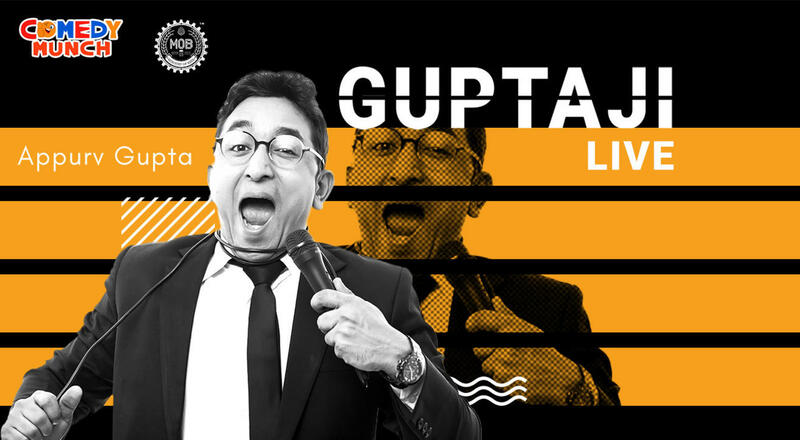 After dissolving the whole country into laughter, people's favourite Gupta Ji is back from his thriving stand-up tour. Don't miss this one before he flies onto some other adventure. Catch Gupta Ji live at the Ministry of Beer, Gurgaon, on 30th September, 8 PM. Comedy Central India says that he is India's leading Hinglish stand-up comic. He is famous for his clean comedy. NDTV Prime shows him regularly with his exclusive show "The Rising Stars of Comedy with Appurv Gupta." His recent video on mobile-phone and his solo show 'AppurView' and 'RelationShipOrRelationShit' has already got multiple reviews on YouTube, Facebook, Twitter and WhatsApp. He is also famous for his web series Mudde Ki Baat - #Gupta_Ji_Ke_Sath on various trending issues. Recently, Forbes India had listed his name in the Forbes India Celebrity 100 Nominees list for 2015.